Chromosomes are thread-like structures located inside the nucleus of animal and plant cells. Each chromosome is made of protein and a single molecule of deoxyribonucleic acid (DNA). Passed from parents to offspring, DNA contains the specific instructions that make each type of living creature unique. The term chromosome comes from the Greek words for color (chroma) and body (soma). Scientists gave this name to chromosomes because they are cell structures, or bodies, that are strongly stained by some colorful dyes used in research. In eukarytoic cells, chromosomes are composed of single molecule of DNA with many copies of five types of histones. Histones are proteins molecules and are rich in lysine and arginine residues, they are positively charged. Hence they bind tightly to the negatively-charged phosphates in the DNA sequence. A small number of non-histone proteins are also present, these are mostly transcription factors. Transcription factors regulate which parts of DNA to be transcribed into RNA. During most of the cell’s life cycle, chromosomes are elongated and cannot be observed under the microscope. During the S phase of the mitotic cell cycle the chromosomes are duplicated. At the beginning of mitosis the chromosomes are duplicated and they begin to condense into short structures which can be stained and observed easily under the light microscope. These duplicated condensed chromosomes are known as dyads. 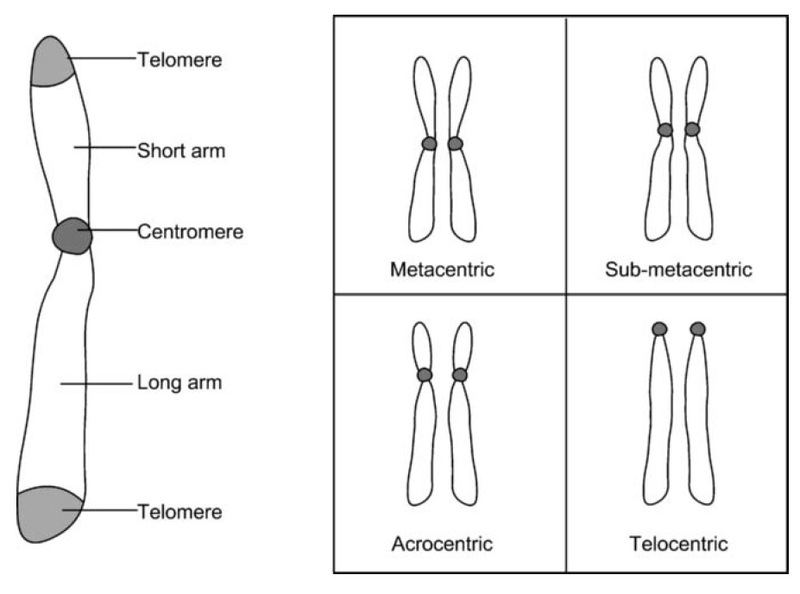 The duplicated chromosomes are held together at the region of centromeres. The centromeres in humans are made of about 1-10 million base pairs of DNA. The DNA of the centromere are mostly repetitive short sequences of DNA, the sequences are repeated over and over in tandem arrays. The attached, duplicated chromosomes are commonly called sister chromatids. Kinetochores are the attachment point for spindle fibers which helps to pull apart the sister chromatids as the mitosis process proceeds to anaphase stage. The kinetochores are a complex of about 80 different proteins. The shorter arm of the two arms of the chromosome extending from the centromere is called the p arm and the longer arm is known the q arm. Chromosomes are divided into two parts (p and q arms) with a constriction point called a centromere in the middle.